If there is one thing that the political establishment of Washington can agree upon, it is that the big, bad, sequester is looming and will result in terrible pain for the entire country. Politicians of both parties are meeting and politically positioning themselves to avert the incoming “crises” that is soon to be caused by the sequester that they voted into effect (and, of course, to capitalize on whatever possible result). In many ways, the discussion surrounding the sequester illustrates a fact that many in Washington are unwilling to publically acknowledge, even with the evidence staring them in the face: Austerity damages the economy in the short-term and is not the way to promote employment. Created in a deal to resolve the 2011 budget situation, the “sequestration” is a large package of cuts that were originally intended to be a failsafe to incentivize lawmakers to agree on a grand bargain; as agreement was not reached, the sequester will take effect starting March 1st, 2013. The “across the board cuts” contained in the sequester will cut billions of dollars in spending from discretionary programs and defense—entitlements will not be touched and taxes will not increase. Discretionary cuts essentially boil down to cuts in social programs, public works projects, public services (ex. teachers, police, etc. ), and other selected federally funded programs (ex. Pell grants). Throughout the entire last few years, Republicans and many Democrats have promoted the idea that government spending is out of control and that government waste/debt is the only thing that needs to be addressed in order to fix our country’s economic problems. These politicians have forced our country to debate endless proposals to “cut, cut, cut” the deficit in the hope that such a situation would help our country climb out of the fiscal mess that it is in. If these politicians were being intellectually honest when they were saying this—rather than using deficit cutting as a political prop or an excuse to gut entitlements/social programs—they would love the sequester and would not dream of trying to avert it. After all, the sequester is a package of very real cuts that are not simply accounting tricks. It is this hypocritical and selective fear of austerity that illustrates just how hollow the debt-obsessed political groups are. Most of the time, they argue that cuts are good for the economy, as they allow the private markets to expand and fill the space, but, as soon as real cuts are impending, they turn around and lament just how damaging the cuts could be. Austerity is good for our economy and the sequester will cause the private-sector to grow—as the markets see that we are dealing with our debts, they will become more confident and will begin hiring again. In addition to this, the jobs lost by the cuts will be replaced with competitive private sector jobs as the private markets expand into the space where the federal government previously occupied. By this argument, the sequester is nothing to fear and can only result in good things for our country. 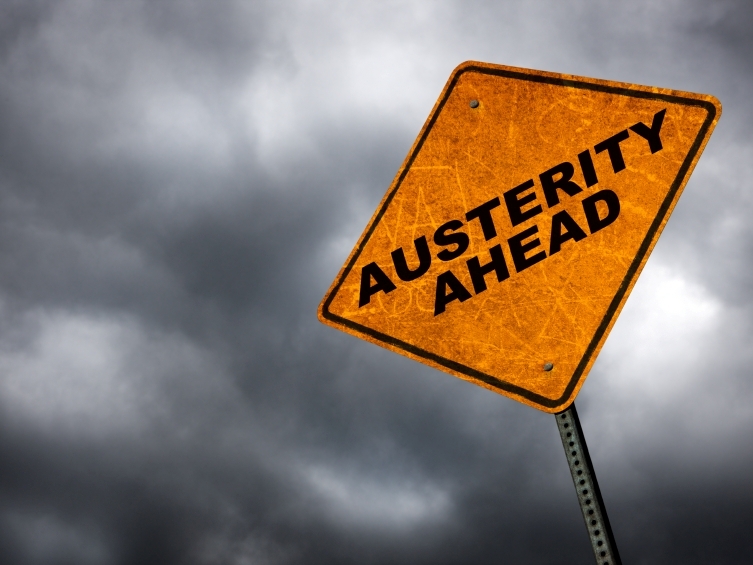 Austerity is bad for our economy and the campaigns to push austerity by the right wing are simply wrongheaded. The sequester cuts will result in many lost jobs and a decrease in the buying power of the country’s economy. As buying power decreases, demand will fall and the economy will stop recovering. By this argument, the sequester is a bad idea for jobs and is something that is to be feared. The fact that the very same people who usually push austerity (the people who normally argue case #1) have suddenly and selectively shifted to agree that the sequester is dangerous to our economy demonstrates that they really don’t believe what they are saying. If they truly believed in their argument for cuts, they would remain consistent in their policy suggestions and would not believe that the sequester cuts would harm our economy. By acknowledging the fact that the sequester may damage the economy, they prove that they are aware that their usual pro-cut stance is not effective in creating jobs. It is certainly true that the debt presents a long-term problem to our country but it is also true that austerity will cause contraction in our economy now—just look at Greece to see proof of this. As is, interest rates and inflation are low, indicating that the debt is not a significant issue in the short term; people are clearly willing to borrow from us and our currency is stable, thus it is demonstrable that our debt is not significantly depressing our economy. In the long term—if our ability to pay our debts comes into question—the high debt of our country could become a problem, but this is far off. Currently, jobs are the problem, not debt, and austerity will only worsen our short-term economic prospects. The validity of the sequester as a policy is arguable and it is entirely possible to want to avert the sequestration cuts while supporting other cuts and not being hypocritical (you could simply believe that the specific cuts included in the sequester are not the most effective). That said, anybody who claims that cuts don’t harm the economy in the short term yet who also says that the cuts embodied by the sequester will harm the economy is either trying to trick you or is wholly ignorant. As they say in America, the s—t just got real.